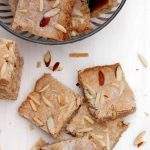 Biscotti’s are Italian Cookies that are part baked, sliced to reveal a feast of mixed nuts and then baked again until crisp and golden. 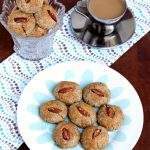 These light and crunchy cookies have walnuts in them and are flavored with orange and coriander seeds. 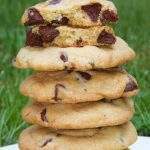 Biscotti’s are twice baked cookies that originated in Italy. 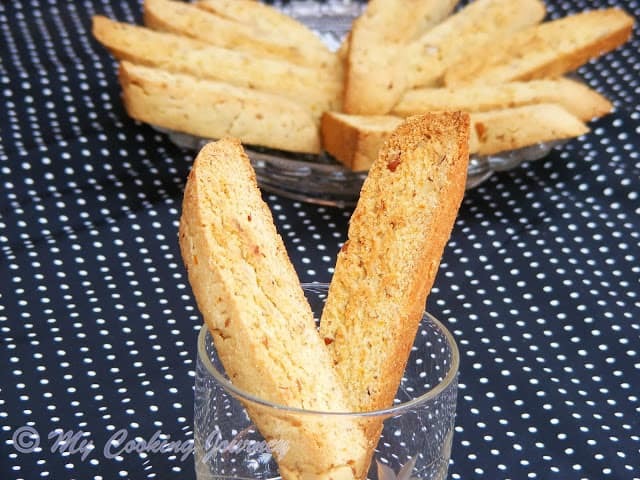 Traditionally an Italian classic, Biscotti have been baked for centuries. It was the perfect food for sailors who were at sea for months at a time. 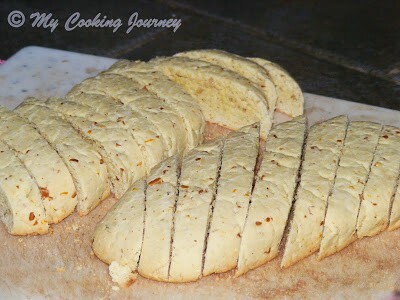 The biscuits were thoroughly baked to draw out moisture, becoming a cracker-like food that was resistant to mold. 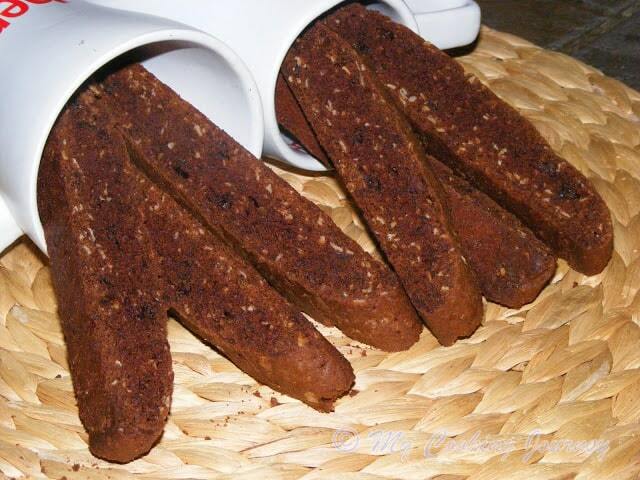 Biscotti were a favorite of Christopher Columbus who relied on them on his long sea voyage. 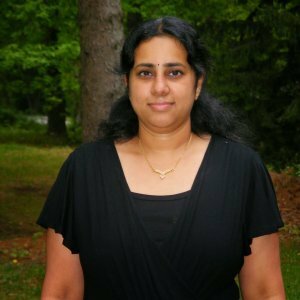 It is a wonderful experience being a part of the group Baking Partners, created and run by Swathi Iyer. 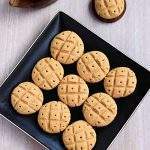 The new techniques and recipes that we learn are lot of fun and it becomes even more exciting when we are doing this with a group. 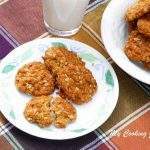 The walnut used in this recipe can be substituted with any other nut of your choice. I used pecans instead of walnuts. Just make sure that you roast your nuts before using (even if they are already roasted). Roasting the nuts brings out the natural nuttiness and it tastes great. 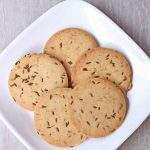 Also do not omit the coriander seeds in the recipe. The flavor of the coriander seed with the orange was a very pleasantly different one. Spread the nuts on a baking sheet and place them in a 325 F/ 160 C preheated oven for 5-7 minutes or until just beginning to brown. Once cooled down to room temperature, chop them into small pieces. Put the sugar and butter in a bowl and beat together well. 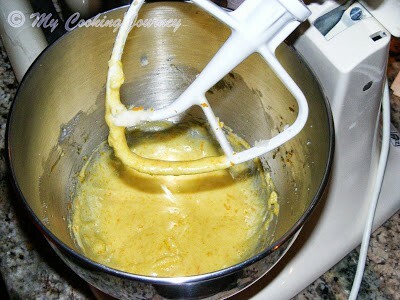 Add the eggs, walnut/olive oil and orange rind and mix well. 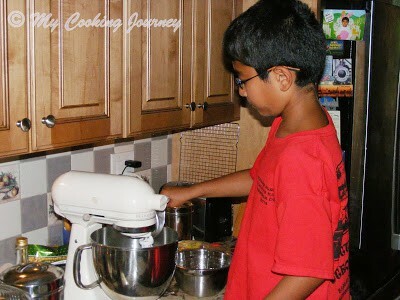 Sift the flour and baking powder over the mixture and add the corn meal, walnuts and crushed coriander seeds. 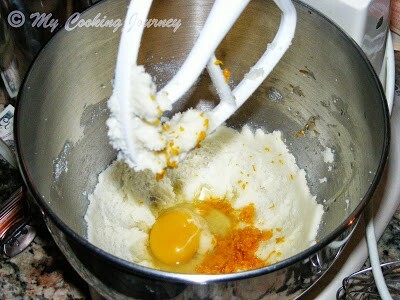 Mix thoroughly and bring together to form a soft, but not too sticky dough. 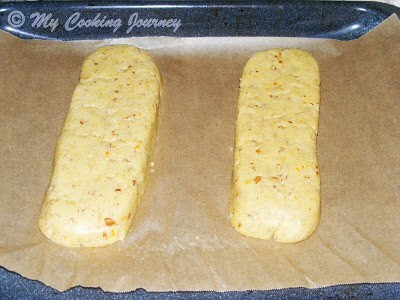 Shape the dough into 4 logs about 18 cms/7inch long and 5cm/2 inch in diameter. 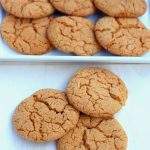 Place them slightly apart on a non stick baking sheet. Bake for 35 mins in preheated 325 F/ 160 C oven until slightly golden. Leave the logs to cool on wire racks for about 10 mins. Then slight diagonally into 1 cm/ ½ inch slices. 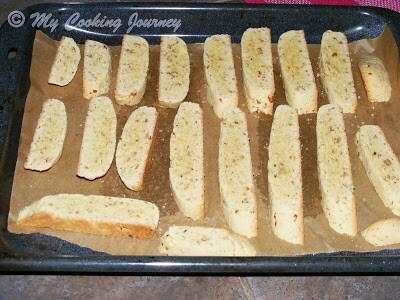 Place them slices on the baking sheet and bake again for 10 mins. 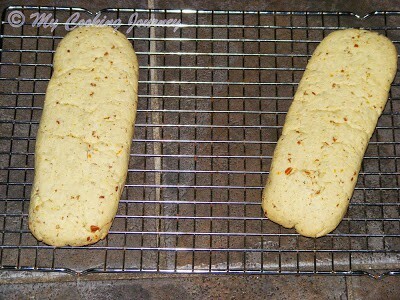 Once the biscotti’s are evenly baked, remove them and cool them in a cooling rack. 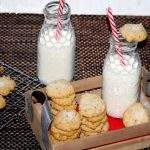 Once cooled entirely, store them in an airtight container for a long time (They stay fresh for over a month or even two), if they remain that long to be stored. Use a sharp, serrated knife to cut the logs; otherwise you would end up breaking the logs. 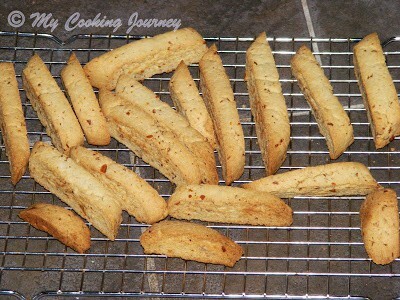 Rotate the biscotti once or twice when baking the second time to ensure even browning on all the sides. 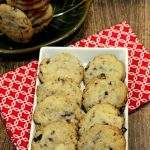 Again the walnut can be substituted to any other nut in the recipe. 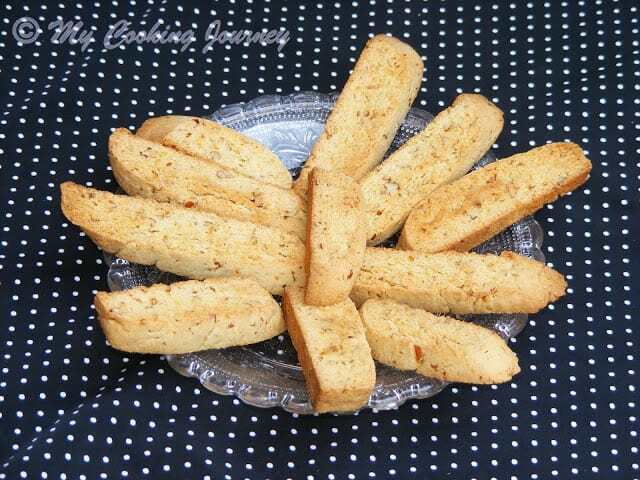 welnut biscotti looks crunchy and yummy. 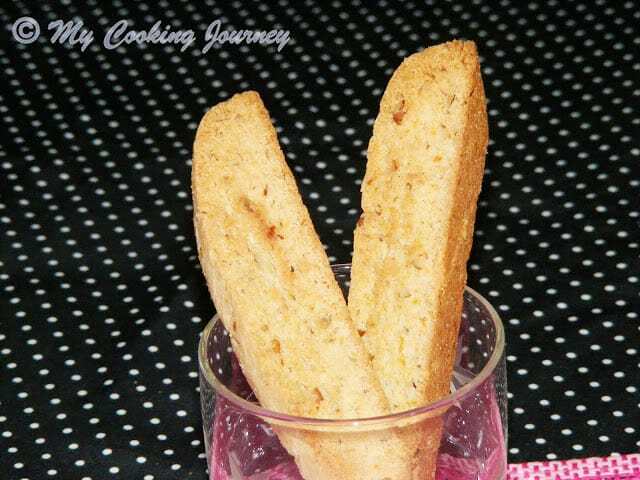 Perfectly sliced biscotti and beautifully clicked too! I love biscottis. I must try out this recipe. interesting combination of walnuts and coriander seeds. 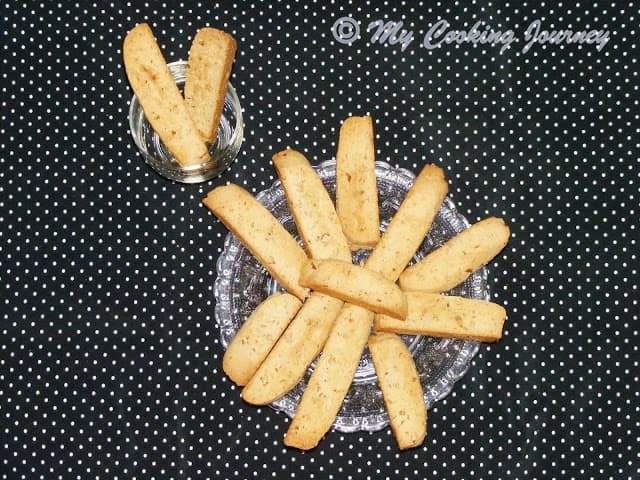 Delicious Biscotti, thanks Sandhya for inspiring me to bake biscotti for first time. you have a cute helper. And flavors you used is really wonderful.